No hard physical stuff today. AM loaded a few cameras with film and set off to do some more pinhole photos on xray film trying to get a handle on how best to use it. 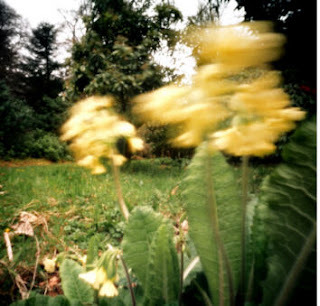 Learned a little and also managed to capture one or two nice pinhole photos. There is a lot going on with the skies I think the sky streaks are ghosts from the very slow manual shutter combined with short exposures..another lesson learned. Anne and I had been out at a dance Friday night so I was a bit delicate Saturday. It was nice and warm and sunny in the morning and after a good laze about by noon I was feeling much livelier and in need of a bit of light exercise. 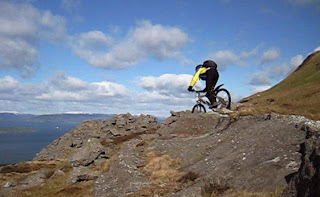 I pulled the MTB out the shed for a gentle spin around the Hunterston Peninsula easy going and very scienic along the beach and past Portencross. Sunday it was Grahams turn to feel a bit delicate he'd hurt his back doing nothing much and although he was keen to get out didn't want to do anything too 'risky'. 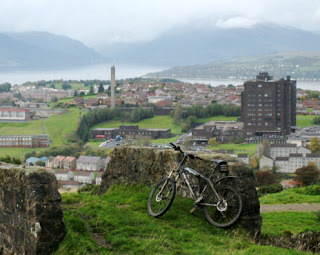 We pottered along to Largs by Portencross, the cycleway to Fairlie then up passed Fairlie Glen castle to the edge of Kelburn coming back down near the marina. The Harlequin Cafe served us some lovely apple tart and coffee well worth the stop off but by the time we got out the rain had started. It was pretty cold cycling back into the wind and rain. Fortunately it didn't last and half way home it eased up enough for us both to warm up a bit. I pottered at a pinhole camera mod and when it cleared pm got out to shoot a few photos on my cheap(ish) xray film. I'm not happy with the results though but I'll try copying them again tomorrow in better light. Fingers crossed maybe day light will work its magic. 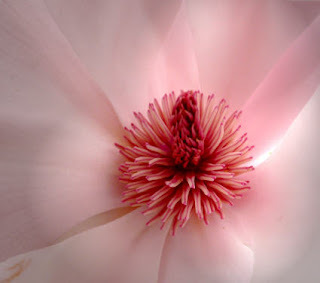 View my photos here on Flickr. 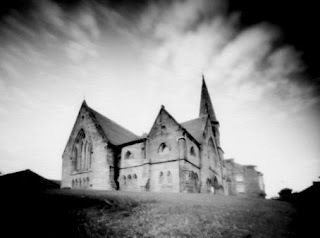 I've been distracted in the evening recently with developing my own black and white films and pinhole photos on paper, doctoring them up and uploading them to FLICKR. Anne and I have been out on the road bikes, Saturday past we cycled along to Kilbarchan on a little 10 mile route. I thought at Kilbarchan I could get a few pinhole photos of the church and weavers cottage. I cycled home from Castle Semple giving me about 35 miles. Sunday I pottered about for 6 hours on the road bike to Dundonald castle then over to Barnweil monument. Funny dog up there friendly until I swung my leg over the bike when it went crazy. I got off and it was fine again back on it went daft. The owner finally dragged it away, she wasn't pleased when I called it a silly mutt! A Barnweill route here but not the one I did from West Kilbride. Monday more biking this time from Beith to Lochwinnoch via Howwood for Anne. I cycled home again but it was hard going on the route I chose all against the grain of the land seemed like an infinity of ups and downs. Yesterday I just played at photo stuff and had a run down the beach later in the day, wish I hadn't bothered though I was still tired from all that ups and downs from Monday, had to walk several times. Today we had a long walk along the hills to Largs, great walk and a great bit of coffee and cake in Craigmiles cafe at the end. View the Largs route here. Its been blowing half a gale all week, I haven't been near the bike. Today Anne and I went up the road to Glasgow (in the car) to do a little bit of sightseeing around Kelvin Grove museum and the surrounding area. Lunch was first followed by a tour of the museum then a walk up to Glasgow University and another museum, the Hunterian. 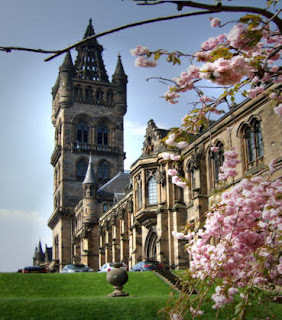 The university was lovely and peaceful after the bizz of Kelvin grove and the Hunterian museum is very nice too. I may well go back up soon to take a few slow photos of the pinhole variety. 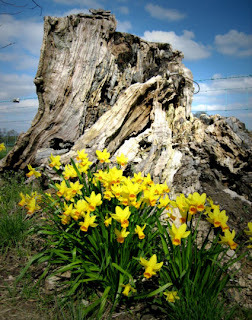 I've been so engrossed in pinhole photo DIY that I haven't found time to do any blogging. On the bike front Anne and I got out for a potter along the New Town Trail around Irvine yesterday. Just had a look and I don't seem to have a route description for it on my web site but we started in Eglinton park and looped clockwise into Irvine mainly on narrow tarmac pleasant enough but not very demanding except as regards dodging broken glass. Today Graham and I got out for something altogether more interesting, up to Lunderston Bay for a loop to Cornalees and the Kelly cut, a combination of this route for the Kelly cut and part of this one for north of Cornalees, a case of mix and match. We climbed from Lunderston to Cornalees, looped over the hill, back to Cornalees for coffee and cake at the cafe, then along the Kelly cut to Wemyss Bay and the very rough mid road back to Lunderston. The sun shone and it was wonderful, not just nice, but ...err wonderful. Comment from rob re Rhinns of Kells, I have been along it to Corserine on the bike but its for masochists only view the route I did here. 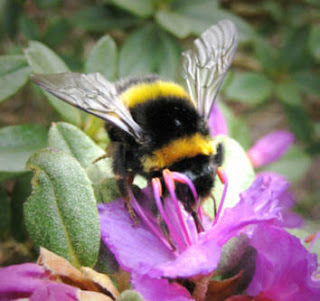 Anne and I went off down to Culzean today to view all the spring flowers, wow! it was fabulous. Lots of stuff to see in the hazy sunshine. 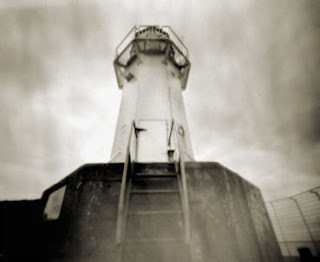 Took quite a few photos including some pinhole stuff yet to be processed view them here. Lovely and cool today if a bit breazy, finally dragged myself outdoors just after midday mountain biking over Glentane and up to the very top of Kaim hill for the full downhill thrill. Ages since I'd been up there and it showed. I was quite rusty at the technical stuff, a few sections I didn't get first time partly because they're erroded but mainly due to my low confidence.I think a little bit of trail maintenance is needed to get the flow of the track back, a few rocks in mud holes and at a drop off that seems to have got rather bigger than I remember. Great fun though - a lovely couple of hard hours on the bike. Too nice to squander another day on photo stuff (unless its snaps from the bike) so got out the road bike for a slightly longer outing today a loop over lots of little quiet roads to Dundonald. Didn't do the full route though I cut a few corners but it took me 5 hours of easy going cycling. With the sun shining its so easy to enjoy a day on the bike I even took a couple of short detours to get extra photos. Coming back through Ardrossan I noticed the memorial to those lost on HMS Dasher was covered in wreaths, the date of the tragedy was 27March 1943. The ships aero fuel blew up and it sank very quickly in the Clyde just south of Wee Cumbrae. The whole incident is still clouded in secrecy but those lost are still remembered to this day. Many of the wreaths had hand written dedications, very touching. I was keen to get a few pinhole photos this morning, loaded up some cameras with film and set off around the village to capture a few in the lovely morning sunshine. Nice but then I squandered the rest of the morning in the darkroom developing them. PM though I got out for a blast on the mountain bike over Busbie Muir windfarm, just wonderful up there cool and clear, with the skylarks chirping away and great views over the Clyde to Arran. Came back down the 'Kings' road to Law Castle and steeply down into the village, mud flying off the wheels. It was still quite early but again I was keen to copy the mornings photos into the computer so, after hosing down the bike, it was back to the 'digital darkroom' for me. View the mornings B&W pinhole slideshow"